Albert Schatz, Ph.D – “Fluoridation … it is the greatest fraud that has ever been perpetrated and it has been perpetrated on more people than any other fraud has.” Professor Albert Schatz, Ph.D. (Microbiology), Discoverer of streptomycin and Nobel Prize Winner. Dr. Charles Gordon Heyd – “I am appalled at the prospect of using water as a vehicle for drugs. Fluoride is a corrosive poison that will produce serious effects on a long range basis. Any attempt to use water this way is deplorable.” Dr. Charles Gordon Heyd is the former president of the American Medical Association. January 2011 – The U.S. Centers for Disease Controltoday issued a startling report that admits 2 in 5 children in America show signs of fluoride poisoning (streaking, spotting or pitting of teeth due to dental fluorosis). The agency concluded that fluoride levels need to be lowered in municipal water supplies, reducing fluoride to 0.7 milligrams per liter (the previous recommended upper limit was 1.2 milligrams per liter). This ends over five decades of the U.S. government recommending up to 1.2 milligrams of fluoride in every liter of water. But even the new lower levels are still more than enough to cause serious harm to children, and when mothers make infant formula using fluoridated tap water, they inadvertently poison their infants with hundreds of times the level of fluoride that would normally be found in healthy human breast milk. Fluoride and fluoridation will go down as one of the greatest controversies of the 20th century. Up until the early 1940’s, fluorine’s effect on life was always deemed poisonous. It was proven to be altering enzymes used by living organisms to carry out a multitude of essential processes. Fluorine, the most reactive element on the planet, is also the strongest free radical. For the past 20 years I have been using an Calcium Bentonite Clay to protect myself and my animals from toxins such as fluoride and to detoxify my body of these poisons. I also use a special water filter ionizer that produces alkaline living water and I avoid mouthwashes and toothpastes that contain fluoride. Scientists in the 1930’s and 1940’s experimented with this element to create the most deadly nerve gases, rocket fuel, and radioactive U235 for the bomb. As a wood preservative, rodentcide and insecticide, fluorine compounds are second to none. As an Orthodontist, I began investigating the increasingly prevalent lines and spots that I saw on the enamel of children. Like rings on a tree, they indicate excessive fluorine exposure. I started to ask the question, “How does fluorine cause these marks?” Chronic doses of fluoride, like arsenic and lead, accumulate in our bodies causing a blockage in the way cells breathe and leads to the malformation of collagen. Cancer, diabetes, thyroid and neurological disorders, hormonal imbalances, heart disease, arthritis and bone loss osteoporosis have all been linked to chronic fluoride ingestion. We are now exposed to increasing doses of fluoride from toothpaste, rinses, water, food, medicines, showering, bathing, and even the air that we breathe. Our environment has become a literal fluoride dumping ground. 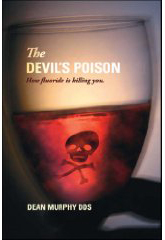 This book explores many chronic diseases that plague man today and looks at the scientists that connected these diseases to chronic exposures of fluoride. In The Fluoride Deception. video, Christopher Bryson, an award-winning journalist and former producer at the BBC, discusses the findings of his new book The Fluoride Deception. “Bryson marshals an impressive amount of research to demonstrate fluoride’s harmfulness, the ties between leading fluoride researchers and the corporations who funded and benefited from their research, and what he says is the duplicity with which fluoridation was sold to the people. The result is a compelling challenge to the reigning dental orthodoxy, which should provoke renewed scientific scrutiny and public debate. Osteoporosis and Arthritis:On July 9, 1998 the Manchester Guardian reported news of fluoride poisoned water in Central India, from untested wells drilled in the 1980s, causing severe arthritic damage to tens of millions of people — a national disaster. Fluoride is the most bone seeking element known to mankind. The US Public Health Service has stated that fluoride makes the bones more brittle and dental enamel more porous. According to an October 28, 1992 Wall Street Journal Article about a study conducted by Varnier JA, et al. : “Rats fed the highest doses developed irregular mincing steps characteristic of senile animals…. Post mortem examination of the rat brains disclosed ‘substantial cell loss in structures associated with dementia — the neo-cortex and hippocampus’.” (Note: Alzheimer’s Disease, first diagnosed by Dr. Alois Alzheimer in 1907, is now the #4 killer for every person over 60 in the US. Every 2nd person over 70 will develop Alzheimer’s.) Environmental fluoride is implicated in this. Fluorides lower the intelligence capacity of humans, with children, again, especially susceptible to early fluoride toxicity. IQ levels were significantly lower than children not exposed to fluorides in all age groups listed. (Li,X.S.,Zhi,J.L.,Gao,R.O.,”Effects of Fluoride Exposure on the Intelligence of Children”, Fluoride;28:182-189, 1995) Further studies proving the neurotoxicity of fluoride in rats have also been conducted by Dr. Phyllis Mullinex. In 1995 Mullenix and co-workers showed that rats given fluoride in drinking water at levels that give rise to plasma levels fluoride concentrations in humans, suffer neurotoxic effects that vary according to when the rats were given the fluoride – as adult animals, as young animals, or through the placenta before birth. Those exposed before birth were born hyperactive and remained so throughout their lives. Those exposed as young animals displayed depressed activity. In 1998 Guan et al. gave similar doses as used by the Mullenix group and found that several key chemicals in the brain – those that form the membrane of brain cells, were substantially depleted in rats given fluoride, as compared to those who did not receive fluoride. Partly based on these findings, the union representing all EPA scientists in Washington have now filed a grievance demanding fluoride-free bottled water for their offices. (Note: this also explains a recent University of South Florida study relating fluoride intake during pregnancy to the yearly 1% increase in learning disabilities found in children…) Studies proving that fluorides transfer through the placenta are well known. Yet other studies of tens of thousands of children show that it isn’t even effective at preventing cavities and is an extremely poor delivery system even if it were effective. Like it or not, your government sometimes lies to you. Groves points out the fact that fluoridation is nothing more or less than a huge government-sponsored lie, conveniently spun so that the super-phosphate industry can rid itself of harmful toxic waste that is illegal and dangerous to release into the air but suddenly becomes a magical “elixir of good teeth” when added to our drinking water. Our endocrine glands that control metabolism are also involved; since it is our thyroid that controls metabolism and metabolism affects how our bowels are functioning. In this way, constipation can be seen as a symptom of hypothyroidism. Low body temperatures (a symptom of hypothyroidism) are very common today …although they are not “normal” … as many authors have reported. One major factor in low body temperatures is the suppression of thyroid function by heavy metals, like mercury, which binds to our thyroid hormones and renders them inactive. Eliminate the mercury and the body temperature is likely to return to normal. 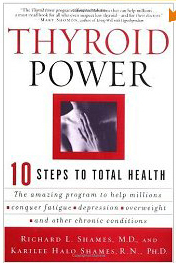 D.C. Jarvis, MD – Iodine is necessary for the thyroid gland’s proper performance of its work. The human thyroid gland is located in the front of the lower part of the neck. All the blood in the body passes through the thyroid gland every 17 minutes. Because the cells making up this gland have an affinity for iodine, during this 17-minute passage the gland’s secretion of iodine kills weak germs that may have gained entry into the blood through an injury to the skin, the lining of nose or throat, or through absorption of food from the digestive tract. Strong, virulent germs are rendered weaker during their passage through the thyroid gland. With each 17 minutes that rolls around they are made still weaker until finally they are killed if the gland has its normal supply of iodine. If it does not, it cannot kill harmful germs circulating in the blood as Nature intended it should. 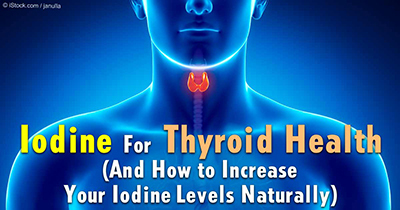 It is well established that the iodine content of the thyroid gland is dependent upon the iodine available in the food and water intake of the individual. If the iodine intake is low the gland is deprived of an element it needs to do its work. Dr. Mercola – “In 2005, eleven unions within the EPA publicly called for a ban of water fluoridation, over concerns that it may cause bone cancer. And in 2006, the American Dental Association warned mothers about using fluoridated water to mix their powdered baby formula. Now, finally, the U.S. Department of Agriculture is developing software to try to assess just how much fluoride you’re ingesting, citing new findings that cumulative fluoride intake might lead to painful skeletal fluorosis. Yet despite long-standing, ever-mounting evidence of fluoride’s hazard to human health, the CDC still clings to its outdated recommendation to add fluoride to drinking water in order to protect your oral health. Even though it was a lie, right from the start. 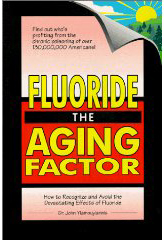 And for those that care aboutwrinkles and such…Fluoride disrupts the connective tissue, causing excessive cross-linking, cysts, and premature aging of the skin! Clearly, getting rid of fluoride is the first important step to take care of your teeth and other problems in the body. Fluoride’s positive image in the United States may rest in part on the whitewashing of unwelcome research findings and the firing of scientists who dared question fluoride’s benefits. Dr. William Marcus, formerly the chief toxicologist for the EPA’s Office of Drinking Water, lost his job in 1991 after he insisted on an unbiased evaluation of fluoride’s potential to cause cancer. Marcus fought his dismissal in court, proved that it was politically motivated and eventually won reinstatement. Marcus now declines comment on the episode beyond saying, “I was right about fluoride’s carcinogenicity, and now we know that.” An investigation by the Senate Environment and Public Works Committee in 1991 supported Marcus’ charges, documenting that government scientists had been coerced to change their findings and portray fluoride more favorably. Dr Robert Verkerk – “Fluorides are extremely reactive molecules which have been shown to cause considerable harm in biological systems. They continue to be used by health authorities for a specific medicinal purpose, namely the treatment and prevention of dental caries, yet they have never been subjected to the full risk/benefit analysis which is required in order to bring other drugs to the market. Drinking water medicated with fluoride clearly amounts to government-sponsored use of an unlicenced drug. It is staggering that international bodies such as the United Nations’ Codex Alimentarius Commission could have overruled the substantial scientific concerns about fluoride in infant formula raised by several countries in November’s Codex meeting in Chiang Mai, Thailand and that babies, the most vulnerable members of our society, are made the innocent victims” Dr Robert Verkerk, Executive Director of the Alliance for Natural Health. August 2002 – Belgium becomes the first country in the world to prohibit fluoride supplements, Fluoride tablets, fluoride drops and fluoride chewing gum, for decades promoted as the crown jewels of dentistry, are going to be taken off the market because they are poisonous and pose a great risk for physical and psychological health. This has been decided by the Federal Minister of Public Health. November 2005 – Most of Western Europe has now abandoned fluoridation of water due to a lack of evidence as to its effectiveness and concerns about major side-effects. 98% of Europe is now free of fluoridated water. deaths. These are memorial descriptions after strict criteria for inclusion, where the actual total lethal racehorse deaths mostly due to bone breakage has been published to be 800 deaths just last year, 2008 in the U.S.
No decrease in teeth cavities occurs from blood fluoride after swallowing, but instead adverse biologic effects occur in the fluoridated human population, including detectable increases in per capita cancer deaths (Yiamouyiannis, Fluoride the Aging Factor, 1970; National Research Council, 2006), increased mental retardation (Osmundson, 2008 see fluoridealert.org), increased heart attack per capita incidence (see http://www.lulu.com ‘Toxicity of Fluoridated Water’), and the well-described epidemic we are now experiencing of lethal bone fractures in elderly people (Nature, 2008). Likewise, the Irish Osteoporosis Society (see fluoridealert.org) reports recently that Ireland, the most heavily fluoridated country in Europe, reports vast increases in hip fractures in the elderly since fluoridation practices began there. Most European nations — including Germany, France, Sweden and Holland — prohibit fluoride on public health grounds. In the United States, there are no warnings posted on fluoride-laced products pertaining to the risks of ingesting too much fluoride or for those at risk from ingesting fluoride. Many dentists and pediatricians who prescribe fluoride supplements, dentists administering fluoride treatments and the manufacturers of fluoride-laced products do not inform people of the risks: (1) Fluoride is poison; second only in toxicity to arsenic which is rated as the most toxic. (2) The fluoride gel used for topical treatments contain concentrations as high as 12,000 ppm (parts per million), well above the probable lethal dosage for a child. (3) A tube of toothpaste contains 1,000 to 1,500 ppm of fluoride which can be a lethal dose for young children. (4) Many children and adults have allergic reactions to fluoride. The more notable reactions are: Restlessness/insomnia, nausea and swelling of the lips. (5) People who have maladies such as: kidney ailments, HlV/AIDS, immunodeficiencies, diabetes and heart ailments are at risk from consuming fluoride-laced products and fluoridated water. (6) The suspected geno-toxic, carcinogenic, and mutagenic effects from long term fluoride intake have not been disproved. Almost every research paper broaching the subjects calls for more research into those areas and states that the evidence of safety is “inconclusive and contradictory”. The same scenario occurred with asbestos. Over the past several years, numerous fluoride-containing medications have been pulled off the market for causing deaths and illness. Fluoride is “highly toxic to the liver,” expert Andreas Schuld of Vancouver, BC Canada said. Schuld, head of Parents of Fluoride Poisoned Children, explained that “In the liver all fluorides interfere with the metabolism of thyroid hormones, creating thyroid disorders and associated diseases, such as muscle diseases ….heart disease, etc.” Other effects can include a serious muscle disease that causes pain and weakness. He cited the recent withdrawal of Baycol, a cholesterol-lowering drug taken by 700,000 Americans, as an example of hidden fluoride-induced dangers that could be lurking in your medications. Baycol, Schuld said, has been linked to 31 U.S. deaths, with at least nine other fatalities worldwide. October 26, 2000 Assemblyman John V. Kelly (R-36) today petitioned FDA Commissioner Jane Henney to take regulatory action against children’s fluoride supplements. The products, drops and tablets, are prescribed for children living in areas with non-fluoridated water to reduce dental caries.